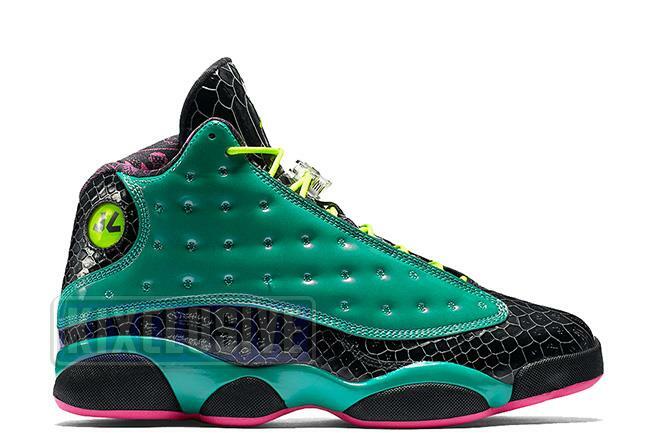 Info: This special Jordan 13 was designed by John Charles, a patient at Doernbecher Hospital. The upper is wrapped in emerald green patent leather while black reptilian scales cover the base of the shoe. Other personal details include the 'Chicken and Jo-Jos' aglets referencing his favorite food and a shoutout for his twin brother Jonah on the sockliner. November 2015 Nike exclusive gradeschool release.